CPM Student TutorialsCPM eBook SupportStudent: CPM eBooks (Student Version) IntroductionStudent Role: How do You Access a CPM eBook Using an Enrollment Pin? This article describes how to use an Enrollment Pin to access an eBook. 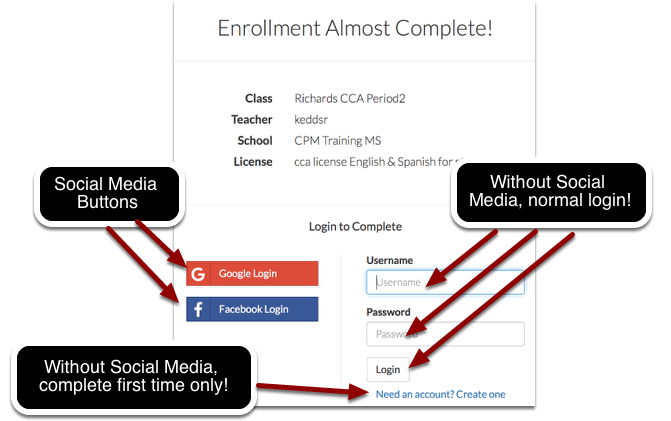 Students using social media (Google or Facebook) will not need to register since they will be tying their CPM account to their social media account. Students without a social media account will register once and then login with their username and password. eBooks will expire in the student account on the date the teacher provides when setting up the Enrollment Pin. NOTE: You will need your enrollment pin only ONCE. 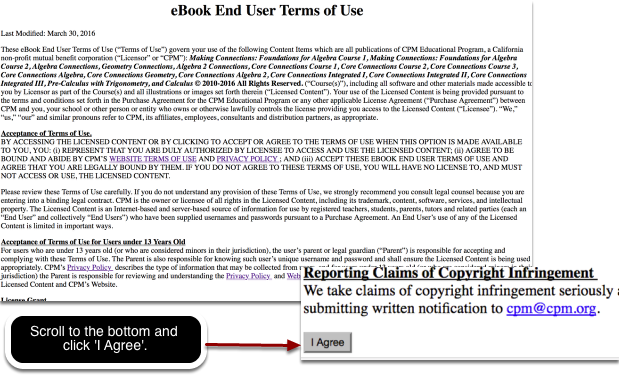 After the first time, you go to ebooks.cpm.org and either click the social media button or login. The following short video shows the various ways students would use an Enrollment Pin to obtain their eBook. 1. Your teacher will give you a 5 character pin number. Do not worry. 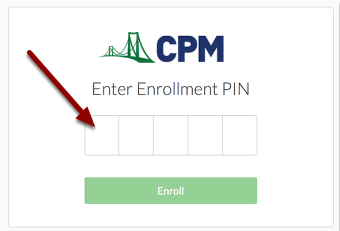 CPM does not store in plain text student emails or passwords! First time only, create an account. After the first time, login using your username and password. Scroll to the bottom and click: I agree. Click on the cover of your ebook to access. Next: eBook: I Forgot My Password!